Sicilia. Syracusae. The Bay of Naples and adjacent Part of Campania. The Two Ports of Brundusium (Brindisi). This is a beautiful 1867 map by William Hughes depicting Sicily, Syracuse and important ports in Italy during the Roman period. 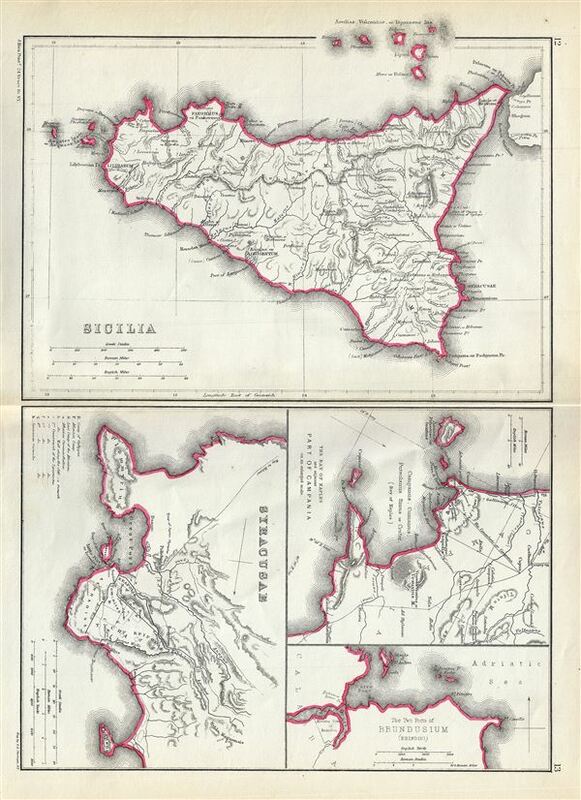 Essentially four maps on the single sheet, the largest map of Sicily depicts the island during ancient Roman Times. The map notes several towns and cities and uses both contemporary and ancient names - an invaluable resource for scholars of antiquity. The map of Syracuse, an important port city and the capital of the Roman government in Sicily is highly detailed and notes important sites with a key included in the lower left quadrant. The ancient walls surrounding the city are also shown. The third map depicts the Bay of Naples and part of Campania. This map also notes important roads, cities and towns that existed during the time, including Pompeii and Herculaneum. Mount Vesuvius, whose violent eruption in 79 AD buried and destroyed the two cities, is identified. The fourth map details the two ports of Brindisi or Brundusium, one of the most important Italian cities during the Roman Era. This map was created by William Hughes, printed by J. Bien and engraved by G.E. Sherman, for issued as plates 12 and 13 in Sheldon and Company's An Atlas of Classical Geography.